I lost my flight.. On purpose.. I was pretty sure I would though, when I left for Palestine. To be honest, I don’t think its gonne make it easier to leave later. The more I know, the more people I know – the more involved I get. And how, I wonder, am I going be able to get on a plane and leave, when my new friends aren’t even able to leave the West Bank. They can’t leave and they can’t live. Are some of my new friends gonne be arrested when I’m gone? Will I lose some? It does not bear thinking about.. Yesterday I came home from the northern Jordan Valley, knackered.. Stayed one night, sleeping under the stars next to a guava grove. Almost a full moon, nice breeze. Accompanied by my Icelandic friend and fellow volunteer Anna, and a very nice new Palestinian friend, Rasheed. Sounds lovely right? To the right we could see the lights from Jordan, separating us was the Jordan river and to the left, the so called holy land.. Still sounds pretty nice? Well, reason for being there was to wait for the Israeli soldiers who had announced that they would arrive the next morning to tear down the green houses of local farmers – claiming they have been stealing water. A.k.a – the water Israel is `legally`taking from the farmers. The local farmers do not have access to the water under their farms, there literally are Israeli waterpipes under their land, going to illegal settlement – and they themselves – do not have access. They are at the mercy of the Israelis who charge them the some of the highest water prices in the world. The day before Israelis soldiers, heavily armed, had come to the village to inspect the pipes.. To see if anyone was stealing their stolen water. In the neighbouring village the soldiers welded shut two connections, and broke a pipe. Cutting farmers off from their water supply. In the past two months this has been happening aggressively. Israelis breaking pipes, Palestinians desperately trying to get water back. This is farmland. The bread basket of Palestine it was known as – due to the immense underground water reserves. 4 times a year they could harvest. But, already the Palestinian population is down from 320.000 to 56.000. The ones left live in refugee camps, in caves (!! ), many in tents (they are not allowed to build – one man has had his home demolished 34 times.. 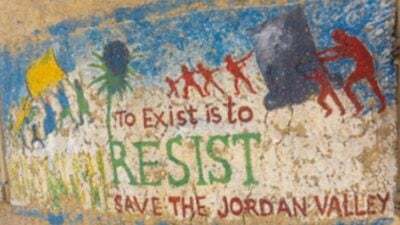 So I guess living in a tent is just practical for obvious reasons) – and some still remain on their farms… To exist is to resist … I saw this written on many walls.. To exist is to resist… Who is the terrorist? Thankfully the soldiers did not wake us up.. I had one scare, when there was a commotion in the bushes not far from my make shift bed… Rasheed was up like a flash and checking with his flash light…in The end he excitedly called me over to reveal a pig.. I never actually saw it though, so I’m not sure if it was a language thing or if it was a pig on the loose… Anyway… Thankfully soldiers did not arrive.. But that’s not to say they wouldnt arrive today, or tomorrow… Not so thankfully we discovered that the water pressure that supplied the Guava field we were next to had been cut off.. Its a communal field. So Rasheed rushed off, us in tow, trying to find the problem… As they only get 2 hours of water for this field.. In the end they gave up… The 2 hours were up anyway… And if the Israelis stop the water, well then they stop the water... I asked, and apologised for asking, if there ever is a possibility of calling the Israelis to see if there is a problem that can be solved with the water they are actually allowed to take… I’m sure you can imagine the answer. For the animal lovers.. Of course this is also affects the wild life.. I did not even consider this.. But the gazelles, the dears….we saw 3 gazelles… They are cut off from the water too… Israel is killing the holy land, if it ever was. But for sure there are legends born and legends dying in Palestine every day. How they manage to continue living, not to give up, to find solutions when Israel finds a new way to oppress… Its just… I don’t know… I’m witnessing the most extreme human greatness… The capacity to make a life in the most difficult of circumstance… When Palestine is free, which I hope will be soon.. We can all come here for holiday, and how I would love to bump in to Palestinians on holiday abroad, not as refugees, but as holiday makers.. If they are this great under occupation, I cant imagine what they will be like when they have their freedom.